Advantage play in roulette specifically relates to professional roulette systems that are widely recognized to produce an advantage. This is why casinos use the term advantage play. 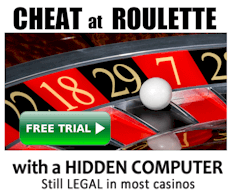 The central website for advantage player roulette is www.roulettephysics.com which lists every known proven system for maximum advantage in roulette. Do not confuse legitimate advantage play with the system for sale called maximum advantage roulette, from Silverthorne publishing, which does not use professional approaches that work. What are Advantage Play Roulette Strategies? By definition they are any strategy that provide the player with a statistical or physical advantage over the casino. They are never based around the betting table, but rather the roulette wheel itself. 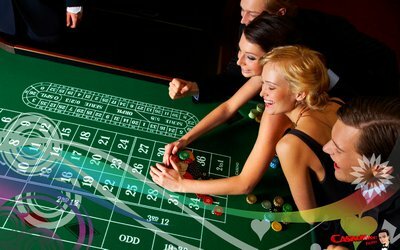 It is a typical gambler fallacy that roulette is all about the table, when in fact the betting table is a scattered representation of the physical wheel. The techniques can be applied in both real and online casinos. Online roulette advantages include the ability to screen record spins using automated software, then replay the spins at a faster speed to obtain the required data. This makes it far easier for professional advantage players to obtain the data they need for analysis. With all roulette advantage systems, except for roulette computers, they take time and effort. This is in contrast to the typical roulette systems that take minutes to learn and apply, but unfortunately eventually blow the players bankroll. What is the best roulette advantage system? The best methods all involve inside bets that are based on roulette wheel sectors. There are some methods that rely on a combination of outside and inside bets, although these reduce the player’s edge with the benefit of making the system more covert to apply. The most common combination bets involve the use of splits where one chip can cover two numbers. With streets and other types of bets, a player can cover particular sectors, although not with the same perfection achieved with individual inside bets. Professional advantage play systems do not involve betting on, black, odds, evens, or any of the more popular types of roulette bets, except in the circumstances explained above. These more common types of bets are essentially gambling because they are guesses that do not relate to specific sectors of the wheel. Bets that represent particular sectors of the wheel are called neighbour bets. Where possible, players prefer to play on European wheels that have a single zero, rather than the 00 on the American wheels. This is because the house edge for European wheels is half of that for American wheels. No staking or betting plan will assist the player to win unless they are first increasing the accuracy of their predictions. Increasing accuracy can only be achieved by application of roulette physics. Mathematics alone cannot beat roulette. In cases where the advantage player has increased the accuracy of predictions, they can afford to gradually increase bet size after losses, because they already have an advantage. The variation of bet size, known as betting progression or the martingale, does not specifically change the player’s edge. What it basically does is decrease the amount of time the player spends inside the casino. After all, time is money, and is important for the player to be out of the casino with their target profit as soon as possible. Is advantage play any different playing online? Online casinos often use live dealers instead of computer animations. Computer animations are not roulette wheels and have no physics involved. They are no different to a slot machine. In casinos that offer live deal roulette, all the principles for winning roulette with advantage play are exactly the same as in real casinos. As explained above though, the advantage of playing online is you can prerecord spins for data collection, which saves a lot of time. Why aren’t typical roulette systems called advantage play? 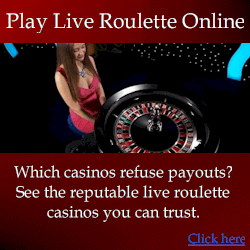 You’d think that casino staff would be at least reasonably aware of what type of roulette systems win and lose. Again they specifically call advantage play systems as such because they do provide the player with a genuine advantage. Casino owners love to see their patrons betting on the outsides of the roulette table because these bets are guaranteed to lose. Consider red and black bets for example. Red and blacks are scattered all over the wheel, alternating red and black. And of course we have the green zero. Is it possible to know the physical variables of the roulette wheel to predict whether the ball will fall in a red pocket, or black pocket? After all consider they are right next to each other. The slightest variance in physical variables can mean the difference between the ball landing in a red or black pocket. Realistically you cannot calculate the variables with sufficient accuracy to make such a precise prediction. Predicting a roulette wheel sector is a very different story, and the variables are predictable enough to achieve sufficiently accurate predictions, at least to overcome the house edge and turn the edge back in the players favour. So to simplify, you cannot be roulette with red and black bets. If the same kind of case with dozens, except where the dozens each represent numbers that are deliberately randomly scattered around the wheel. Consider the numbers one and two, which are both in the first dozen, although on the opposing sides of the wheel (for the European wheel format). With the single zero European wheel, there is one green zero and the house edge is -2.7%. So if you constantly bet on a single number, you can expect to win one in 37 spins, although the payout is 35 to 1. If roulette was a fair game, a win on an individual number will pay 36 to 1, which means you get back your original bet, plus another 36 units. So really even when you win, you still actually lose because the payout is unfair. If you vary the bet size, commonly known as the martingale system, all you do is change the amount you wager on an individual spin. You haven’t at all increased or decreased the chances of winning. With advantage play such as roulette computers, the player edge can be as high as 120%. Putting this into perspective, consider that again the house edge is normally -2.7%. If you are not mathematically inclined, this means that with a roulette computer cheating device, you can achieve an edge around 40 times greater than the casino has over normal players. This is all achieved by calculating the speed of the roulette ball and wheel to predict where the ball will land. The science behind it is actually quite simple, although the modelling of ball behaviour is quite complicated when considering the variations of air pressure and ball deceleration rates. For less effective advantage play methods, a typical edge for the player may be between 5 to 20%. Again considering the normal house edge against the player, these are enormous edges. This is why I often say the key to roulette is not really beating the wheel, because it is actually quite easy. The real secret is not being detected, because if you are detected, the casino will not allow your winning to continue one way or another. The actions of casino staff to prevent professional players winning is called countermeasures. The countermeasures that are applied ultimately depend on how the casino suspects the player is winning. For example, with roulette computers, the measurements of the ball and rotor speed must be taken after the ball has been released, and then the player receives a prediction on which to bet from the computer. So all casino staff need to do, to stop computer players winning, is to call no more bets much earlier. The problem is casinos make a lot more money when they allow late bets. In fact many players prefer to bet after the ball has been released, for various reasons such as they think the dealer may deliberately spin the wheel in a way that makes them lose. But whatever the case, casinos that allow players to bet after the ball has been released tend to earn significantly more. This makes it easier for roulette computer players to win. Vigilant casinos that carefully monitor players for suspicious behaviour will only call no more bets earlier if they suspect a particular player is using a roulette computer. When the player starts to lose or leaves, normal procedures can resume. Is the same case with pretty much any advantage play, where there are ample opportunities for the player to take advantage of the wheel and exploit it for-profit. And usually the most casino is make winning difficult for the player, but it is at a cost to the casino too. Another example is with some advantage play systems, relatively large amounts of data are required. This means many spins need to be analysed. If the casino spun the wheel very infrequently, such methods would be ineffective for the player. But it would also mean there are fewer bets on the table, and the casino earns less. Alternatively, if the casino spun the wheel more frequently, it would be more vulnerable to attack from professional players. The the upside of this for the casino though is that more frequently spinning wheel means average players generally lose money quicker, and the casino profits quicker. Ultimately with everything considered, advantage play roulette systems are likely to be effective for some time to come. With the advent of new technologies in casinos, they are gradually losing effectiveness, but at a very slow rate. At the current rate, I estimate the majority of roulette advantage play methods to be obsolete in approximately 15 years. This still presents a lucrative opportunity for professional players.